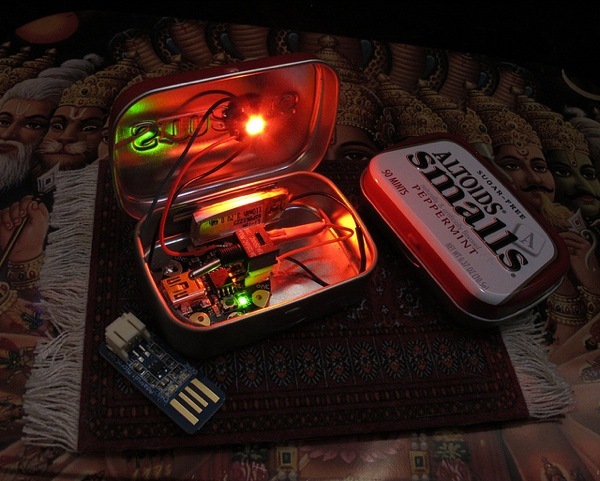 Altoid Tin Mood Light « Adafruit Industries – Makers, hackers, artists, designers and engineers! This neat Altoid Tin Mood Light project by Dr. Speed uses a whole lot of Adafruit goodies (Gemma board, Lipo & Charger, and NeoPixel)! Small altoid tin with Gemma board, Lipo Battery and 1 neopixel. There’s a power switch in there. It’s tight fit getting the battery connector out to recharge it, but the battery lasts for a long time. There’s a simple RGB animation running on it, being a mood light it’s nothing to jarring. What’s that awesome background? An Adafruit goodie too? There is even guy who looks like a cat in it. Does Mosfet know about this?